Know your game to better your game. 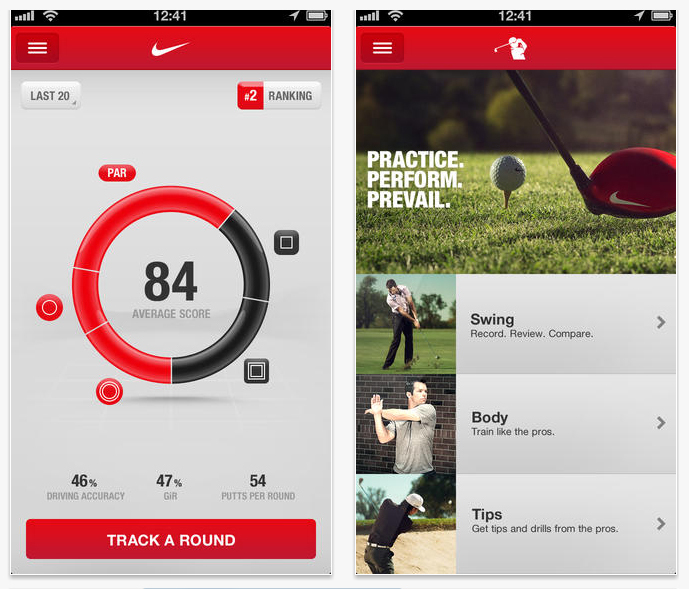 Nike Golf 360 is now available in the U.S., UK, Canada, Ireland, Germany, and Sweden. Join hundreds of thousands of golfers who have already chosen NG360 to raise their games. Start today, and make this your best season yet. - Keep score for up to four players on more than 30,000 courses around the world, then share scorecards with your friends. - Track your stats and see your progress. NG360 helps you to analyze your driving accuracy, greens in regulation and putts-per-round. - Connect and compete with friends and see how your game stacks up on the leaderboards. Keep tabs on the competition, then get out there and go lower. - Capture your swing, break it down, dial it in and learn from the pros. - Train like an athlete. Access golf-specific workout videos and training tips, so you can perform at your best. - Earn trophies and bragging rights. Get the props you deserve when you make noise on the course with more than 20 trophies. Share your achievements with friends on Facebook and Twitter. - Check out the latest Nike Golf gear and equipment. - Get the tools, tips, and motivation you need to make the most of every shot.